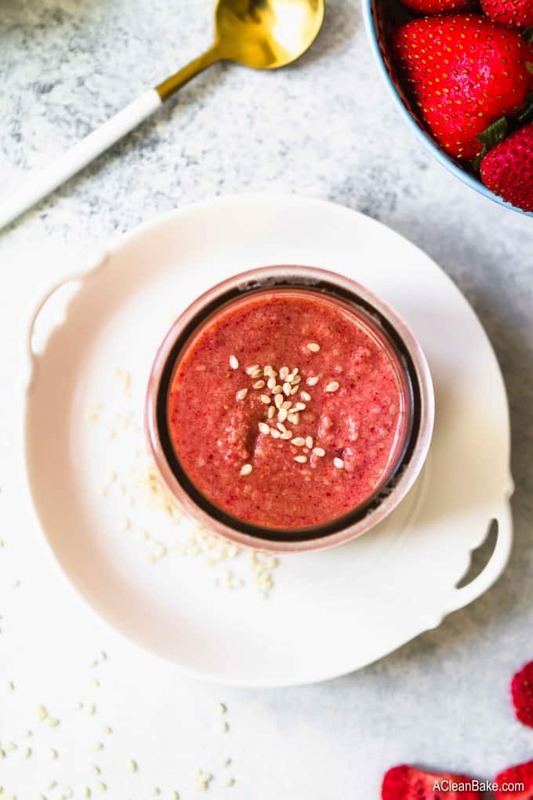 Jump to RecipeIf you’ve tried plain tahini, and you’ve loved chocolate tahini, it’s time you made room for strawberry tahini! This fruity version will convince you that tahini is not just for hummus anymore. I have a quick and easy homemade seed butter recipe for you today, which I’ve been holding on to for way too long. 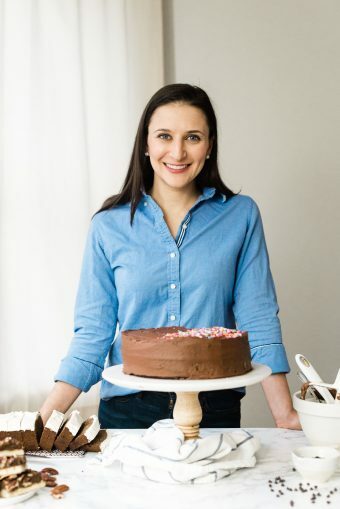 You’ve heard of chocolate tahini and, of course, plain tahini? Well, allow me to introduce you to strawberry tahini. Tahini, in case you’re wracking your brain trying to remember where you’ve heard that word before, is a paste made of ground sesame seeds and (usually) a dash of vanilla. It’s a versatile and flavorful workhorse in the kitchen (well, my kitchen, at least). I think that a lot of people classify it as a unitasking middle eastern condiment. No offense, but you couldn’t be more wrong! Tahini: Free it From its Hummus Cage. Tahini is completely nut free, so makes a perfect replacement for natural almond butter or peanut butter in recipes. (It is very runny, though, so make sure it is stirred well and you still might have an extra liquidly recipe). Sesame seeds are a great source of flavor and healthy fats, making tahini an incredibly versatile ingredient in cooking and baking. My favorite way to use it is in salad dressings and marinades. I have a tahini dressing recipe on a different page, but you can throw together a really creamy, hearty dressing by combining tahini with a little extra virgin olive oil, maple syrup or honey, and some lemon juice, salt, and pepper. Tahini, On Its Own, Deserves a Chance to Shine! But that’s now why we’re here today. Instead of talking about all the things you can make with tahini, it’s time some attention was paid to the spread itself. 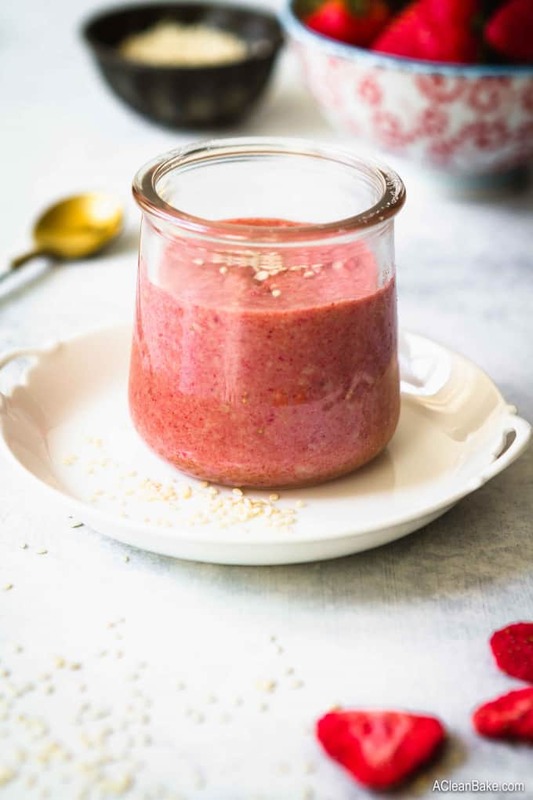 I love this strawberry tahini because it is sweet, but refined sugar free (and high fat, so has a minimal blood sugar impact), fruity, filling and kind of unexpected. It’s incredibly easy to make: all you need are sesame seeds (raw or toasted, although I recommend raw), sesame oil (or a mild flavored oil like avocado oil) and freeze dried strawberries* (I found them at Target and Whole Foods). You put it all in a blender or food processor and puree, and that’s really it. If you want to add a pinch of salt or dash of sweetener, you can. But it’s not necessary. 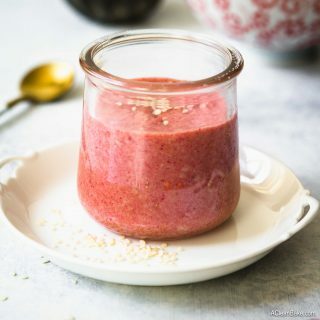 It may seem bonkers to be using packaged dried strawberries at beginning of strawberry season (which, as we all know, we wait all year for), but you absolutely cannot use fresh or roasted strawberries in this tahini because it will result in a watery, gloppy texture, and (as though that’s not enough of a deterrent) the tahini will mold quickly. Using dried strawberries offers the tahini a delicious, concentrated strawberry flavor without the extra moisture. *Strawberries are one of the dirty dozen produce items, so if you can find freeze dried organic strawberries – which you sometimes can at Whole Foods – all the better, but it’s not mandatory. Well, you can use strawberry tahini in a lot of ways in place of any nut butter that you’d use in a sweet application. For example, it’s fantastic on a banana, if you’re a fan of the strawberry-banana flavor combo, or in a PB&J with strawberry jam for a turbo-loaded strawberry flavor. This tahini will be a little liquidy, so it is the perfect ice cream topping. Speaking of ice cream, you can blend it with a chopped frozen banana for an ultra-creamy version of “nice” cream. 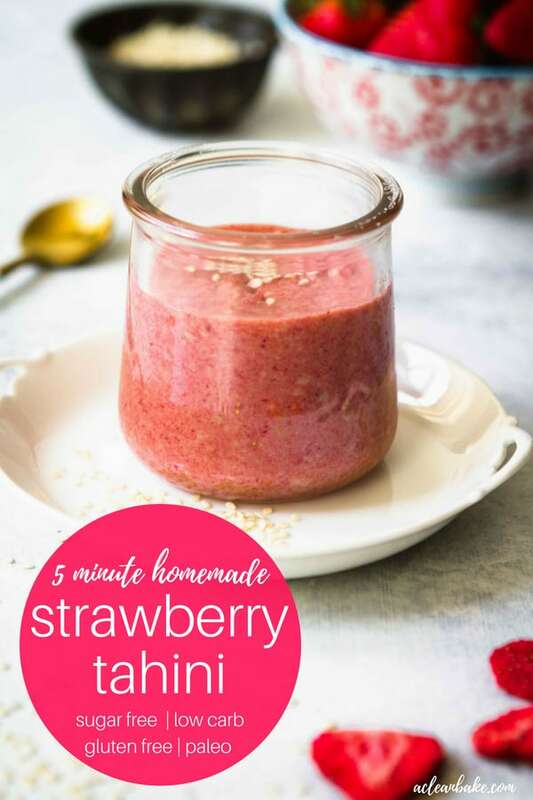 Or, use it to make a strawberry tahini smoothie or strawberry tahini dressing for salads! There are so many more options that I haven’t thought of yet, so use your imagination and let me know! If you've tried plain tahini, and you've loved chocolate tahini, it's time you made room for strawberry tahini! This fruity version will convince you that tahini is not just for hummus anymore. In the bowl of a food processor fitted with the s blade, process the sesame seeds until they form a paste. This may take several minutes. Scrape down the bowl periodically to make sure all of the seeds are being broken down. Add the strawberries and process until they are broken up. The mixture will be quite dry. Add the oil, 1 Tablespoon at a time, with the motor running. Stop when your tahini reaches a smooth, even consistency. You may not need all 5 Tablespoons. Add the vanilla and/or stevia, if you're using it. You may prefer to leave this unsweetened. Enjoy immediately, or transfer to an airtight container for storage. Store in an airtight container in a cool, try place, or in the refrigerator for up to a week. This look soooo good! What a lovely idea, Nora! Gonna try to make this one for my wife, she’ll love it. Thanks for sharing! Can you use tahini already prepared? If so how much? Ooh good questions, Janice. I’ve never tried it. I would estimate around 1 1/2 cups. 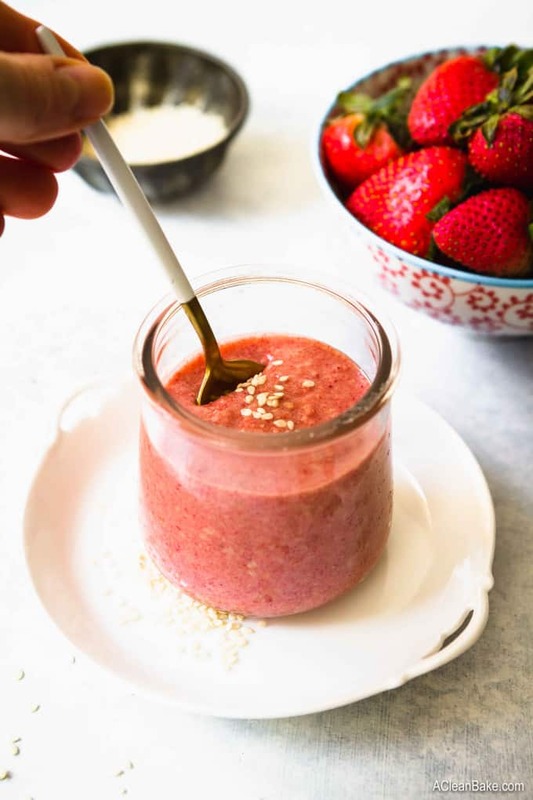 You may still need a little bit of additional sesame oil to keep the tahini smooth once you blend in the (very dry) strawberries. Let me know how it goes!